Last week we had a new sofa delivered. After months of waiting it finally arrived. 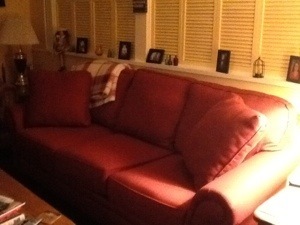 My friend and fellow blogger Lily, @lookinginwardwithlily,convinced me I should write about my old sofa. At first I thought that was silly but then I decided she may be right. Although furniture, houses, cars, etc. don’t have feelings, they hold a lot of memories for us. I remember how sad I was when we sold our old Chevy Astro van because we had so many good times with our boys with that van. Camping trips, vacations, shopping trips, sporting events. The list goes on. I remember all the relatives and friends who have made themselves comfortable on that old sofa. I remember all the laughs and tears that have been shed on that sofa. I remember sitting on that sofa with my husband talking about our future and about how blessed we are in our lives. I thought about how our granddaughter Emma always enjoyed standing on the sofa to play with the knick knacks I have on the shelf behind it when she was a toddler. Her brother, sister and cousins do the same thing. Our grandson Garrett and Granddaughter Zoey spent many hours on that sofa playing with our iPhones and iPads. And course it was always the perfect spot for them (and their Pop Pop) to take their afternoon naps together. Yes, that old sofa holds a lot of memories for us. I hope the new sofa will give us a new set of memories.